Just thought I'd let you know about my issue with Synergy 2. 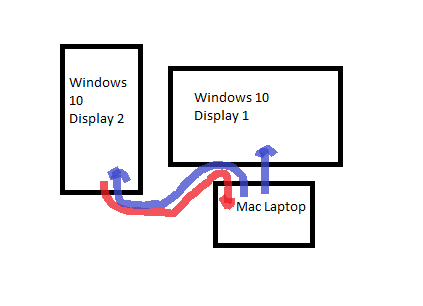 I have a windows 10 host (5ldyq12) with two monitors and a mac laptop client. The monitor arrangement is shown in the image, Synergy_problem.png. The landscape monitor (display 1) is my main work area with the portrait monitor (display 2) used for documents etc. The laptop is positioned below display 1. 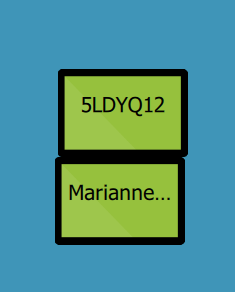 The synergy config has the laptop directly below the host (Synergy_config.png). I can only move my mouse to from host to client via display 2 (see red arrow); from client to host, the mouse easily moves directly from client to display 1 or display 2 (blue arrows). I cannot however move the mouse from display 1 directly to the client. Given my monitor arrangement, this is painful. Synergy 1 worked fine with this arrangement - problem has existed in betas 2-4 (don't think I used beta 1 so can't say if it was there or not). Interesting, could be because they're not perfectly aligned?